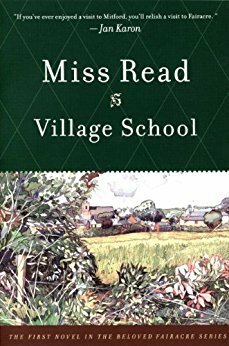 The first novel in the beloved Fairacre series, VILLAGE SCHOOL introduces the remarkable schoolmistress Miss Read and her lovable group of children, who, with a mixture of skinned knees and smiles, are just as likely to lose themselves as their mittens. This is the English village of Fairacre: a handful of thatch-roofed cottages, a church, the school, the promise of fair weather, friendly faces, and good cheer — at least most of the time. Here everyone knows everyone else’s business, and the villagers like each other anyway (even Miss Pringle, the irascible, gloomy cleaner of Fairacre School). With a wise heart and a discerning eye, Miss Read guides us through one crisp, glistening autumn in her village and introduces us to a cast of unforgettable characters and a world of drama, romance, and humor, all within a stone’s throw of the school. By the time winter comes, you’ll be nestled snugly into the warmth and wit of Fairacre and won’t want to leave.